MR says: This is simply incredible! A movie newsreel from the Great Depression touting Mormons, the Church's Welfare Plan, and how "its members [are] the wealthiest churchgoers in the world." “The March … of Time!” There you were, sitting in a darkened movie theater in the 1930s or ’40s, maybe with a sack full of popcorn, waiting for the feature film to begin. The dramatic voice of Westbrook Van Voorhis boomed through the theater, narrating the story behind the black and white images of the newsreel on the screen. If you went to the movies in March 1935, you might have caught the second episode of The March of Time and seen your first moving pictures of Adolf Hitler, and heard about the sentencing of Bruno Hauptmann for the kidnapping and murder of Charles Lindbergh’s young son. In August 1936, you would have seen a profile of Albania’s King Zog I and a segment about harsh conditions faced by sharecropping families in the American South. And in January 1937 … well, in January 1937, you would have watched a segment about the economic success of the Church of Jesus Christ of Latter-day Saints. Producers of The March of Time were always interested in economic stories, and that’s what they chose to focus on when they went to Salt Lake City in December 1936. They showed scenes of Salt Lake’s major downtown buildings, and took their cameras into a meeting of Heber “Jedediah” Grant with his “Wise Men,” discussing the Church’s Welfare Plan, and tithing, and Church financial investments. In one somewhat misleading scene, they show lines of presumed Mormons doing their routine banking in a commercial bank, while the voiceover describes the payment of tithes, suggesting that tithing was paid in that assembly-line, business-like manner. 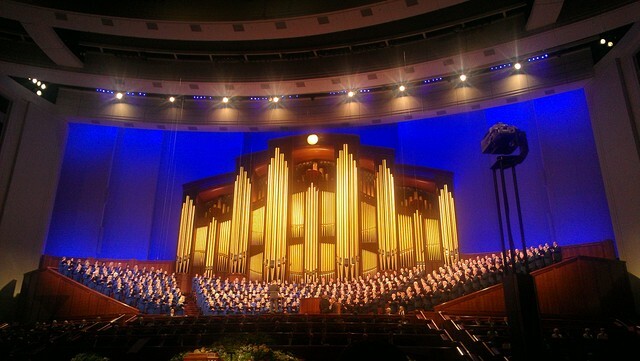 They also talked about the Book of Mormon, and showed a few seconds of the Tabernacle Choir singing before the grand pipes of the Tabernacle organ, with the women dressed in somewhat Protestant choir robes (a novel image to me). The newsreel still exists, and I would have loved to have embedded it in this post, but licensing would have cost me too many hundreds of dollars. Still, you can watch a few seconds of the film here – and I recommend you do that now, so that you can read the transcription with the narrator’s distinctive voice in mind. Hurry back.